You know how it is when you move, all the friends and relatives want to come over and see the new place. I wasn’t quite up to a full-blown dinner party, but I did want to have some nice little tea and crumpets for them to nosh on, after the grand tour. Lol. The grand tour isn’t much in a two bedroom apartment, let me tell you. But I did make these Rugelach and they were a big hit. 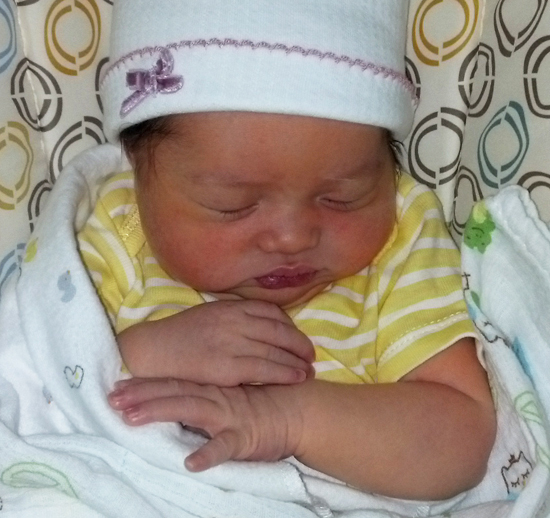 The really BIG EXCITING NEWS is that on March 21st my new granddaughter, Coralina, was born. Remember the wedding of my oldest son, David and Loan-Anh, last May? Well, they are now the proud new parents of this beautiful babykins. They live near Davis, CA, and I am in Los Angeles, so I am hoping to go visit them in the near future. You remember how magical babies smell and how you can cup their round fuzzy heads in your hand. Oh yes, I am really looking forward to meeting her for the first time. Hugs and kisses. 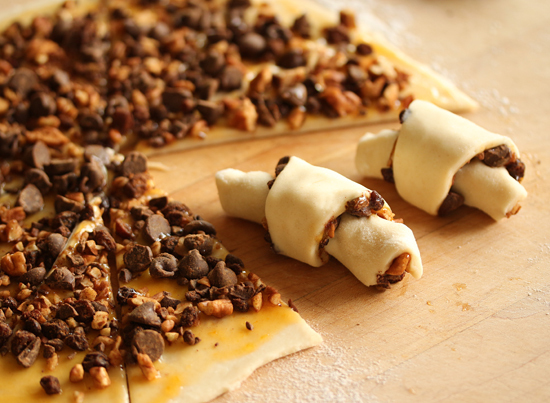 To make the rugelach, the dough is rolled out and spread with apricot preserves, then sprinkled with the chocolate, pecan and currant mixture. The circle is cut into pie wedges and rolled up, starting from the large edge. Yes, the filling does its darndest to fall out, but push it back in and persevere. 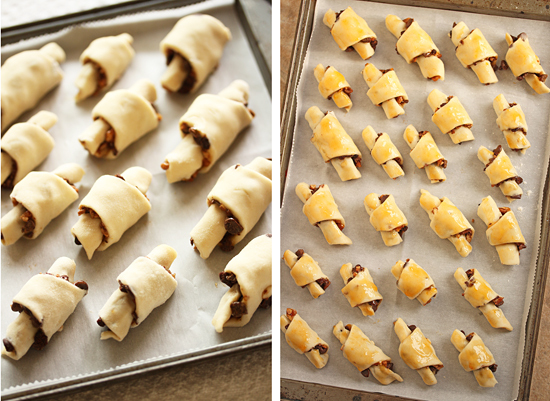 You really can get 24 rugelach on each cookie sheet, by turning them at an angle. They’re brushed with more apricot preserves before being popped in the oven. After about 20 minutes in the oven, the smell of apricot preserves filled every room. It was so delicious an aroma that I couldn’t wait to shoot them. Here they are in the oven. This post was about two yummy little sweet things. Being a grandma is such an amazing thing, and now I will be able to share baby pics and baby stories. So much fun! 1. In a large bowl, beat butter and cream cheese with an electric mixer on high speed until soft and creamy, about 1 minute. 2. Mix in sour cream and 2 tablespoons of sugar until well combined, about 1 minute. 3. Stir in flour by hand until well blended. Wrap dough in plastic swap and refrigerate for at least 2 hours or overnight. 4. In a medium bowl, combine chocolate, pecans, plumped currants, cinnamon and remaining 3 tablespoons sugar. Set aside at room temperature. 5. Preheat oven to 350 degrees F. Line 2 baking sheets with parchment. Place 2 oven racks in upper and lower third of oven. 6. Divide dough into 4 equal portions; refrigerate all but 1. On a lightly floured surface, form dough into a ball and flatten it out. Roll dough into a circle about 10 inches in diameter and 1/8 inch thick. 7. Brush 2 tablespoons of apricot preserves over dough. Sprinkle 2/3 cup chocolate mixture evenly over dough and press down gently. 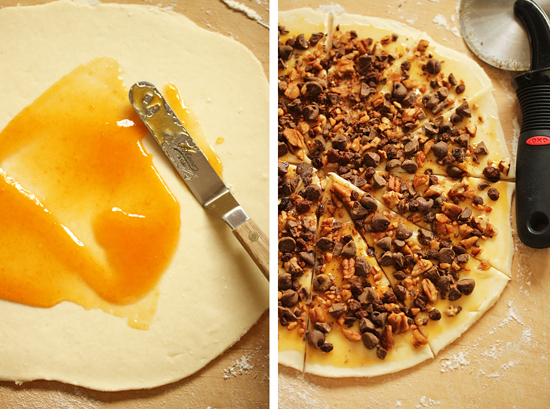 Cut dough into 12 triangles. 8. Starting with first triangle, roll dough tightly, but carefully, from the wide end toward the point. Place the rugelach, with the pointed side underneath, on parchment lined baking sheet. 9. Roll up remaining triangles in same manner and arrange on baking sheet, about ½ inch apart. Repeat with remaining 3 dough balls, preserves and chocolate mixture. 10. Lightly brush tops of rugelach with remaining 2 tablespoons apricot preserves. 11. Bake, switching sheets after 20 minutes, for 35 to 40 minutes, or until well browned. Immediately transfer rugelach to rack to cool. 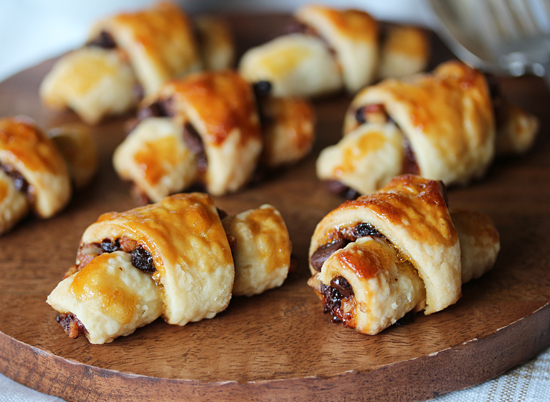 Note: The rugelach can be frozen, well wrapped, for up to 2 weeks; let return to room temperature before serving. Wow, congrats! Such exciting news! Love her name and she is adorable! 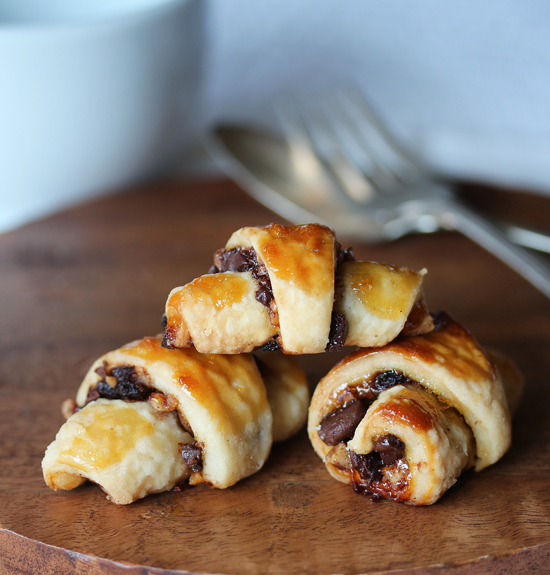 I’ve never seen a rugelach recipe quite like this one, and I’ve seen a lot! And I learned a new trick, brushing the tops with the apricot preserves. 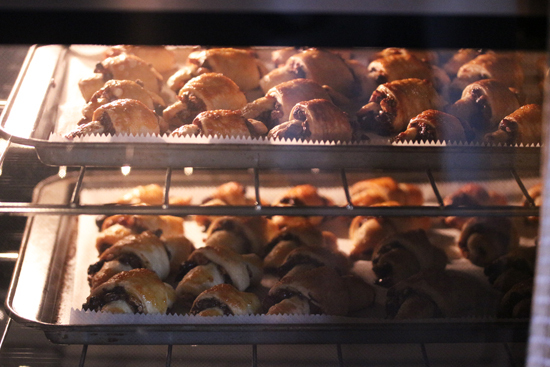 That first photo is perhaps the single best rugelach shot in the history of rugelach photography. I’m dyin’ over here! What a beautiful little girl Coralina is. As pretty as her name. and was looking for a good rugelach recipe. Good thing I found yours!